The figures in parentheses below the program number designate the poster area and site. Poster sessions are in Room 1 (see floor plan). The coloured numbers of the poster board are intended as orientation aids for discussion monitors and poster presenters. Thursday 4 April 2013 from 7:30 a.m.
Friday 5 April 2013 from 8:00 a.m.
Saturday 6 April 2013 from 8:00 a.m.
Thursday 4 April 2013 9:30 – 11:00 a.m. and 2:30 – 4:00 p.m.
Friday 5 April 2013 10:00 – 11:30 a.m. and 4:00 – 5:30 p.m.
Saturday 6 April 2013 10:00 – 11:30 a.m. The posters will be displayed all day. The discussion moderators will choose the best poster from each section and affix the society’s signet to it. The selected posters should be mounted on poster boards set up for this purpose in Room 1 immediately after the poster session (Details can be obtained from the Poster Service). A prize jury will select the best three of these posters before the end of the conference. 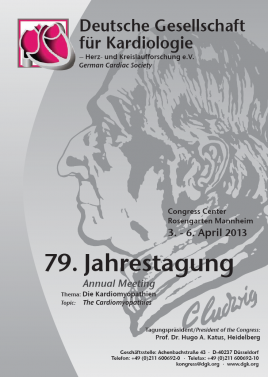 The award winners will be announced and the prizes presented by the Society’s Conference President on Saturday, 6 April 2013 at 1:00 p.m. in hall 4/Saal 4. The abstracts submitted over the AG34 portal will be presented and discussed on Friday morning in Poster Section S. The best three posters will be selected by the two Poster Chairs and will be awarded the Poster Prize for Assistance Staff in Cardiology. The award winners will be announced and the prizes presented on Friday, 5 April 2013 at 2:30 p.m. in hall 3/Saal 3.